Images 1 and 2: These trousers show significant folding in the gluteal region at the side and rear views, technically known as „Horseshoe folds“. These folds are known by the nickname „Horseshoe folds”. They are formed in the trousers immediately below the gluteal region and originate mostly through excessively crooked undersides. These fitting errors occur especially when dealing with an erect or stocky figure; this then pushes the abdomen forward and thus naturally forms shortness in the gluteal region. These folds can be got around without special difficulty, however you must not fall into the opposite error and cut the trousers too short in the back, especially for the stocky or corpulent figure. Such folds are also very commonly criticised as flaws — although to an essentially lesser degree, however they could be regarded as natural folds. It must be distinguished whether the length of the trousers in the buttocks region may be considered an error or be regarded as natural folds. The apparently (to the customer) excessive length in the gluteal region is pinned away as a horizontal fold with a few pins. 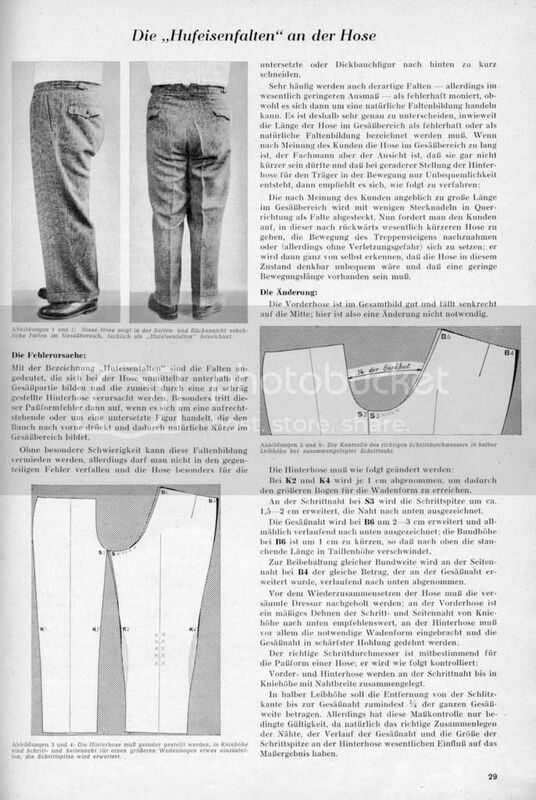 Now the customer is asked, with these trousers now shorter in the back, to mimic the action of climbing stairs (although without risk of injury [or damage]) or to sit down: he will recognise for himself, that the trousers in this state would be extremely uncomfortable and that a bit of movement length [Bewegungslänge] must be allowed for. Images 3 and 4: The undersides must have a straighter seat angle, the inseam and sideseam are narrowed at the knee height to achieve a better development of the calf curve, the crotch point is extended. The topsides look good generally and are hanging straight to the middle (centre seams); so changes are not necessary here. 1 cm each is removed from K2 and K4, to achieve thereby a greater curve for the calf shape. The crotch point is extended about 1,5 — 2 cm at S3; redraw the inseam line down. The seat-seam is extended at B6 about 2 — 3 cm and gradually smoothed in downward; the waistband height at B6 is shortened about 1 cm, so that the pushing length at the waistband disappears. To maintain the same waist length, the same amount that was added to the seat seam must be removed gradually at the side seam at B4. Before the reassembly of the trousers the omitted ironwork must be done; to the topsides, a moderate stretching of the inseam and side seam from the knee height down is recommended, to the undersides, above all the necessary calf form must be obtained and the seat-seam is stretched at the a deepest hollow of its curve. At half the rise, the distance from the edge of the fly across to the seat-seam should amount to at least ¼ of the whole seat width. However, this measurement control has only limited validity, naturally the correct assembly of the seam lines, the run of the seat-seam line and the size of the crotch point of the undersides have an essential influence on the results of the measurement. Images 5 and 6: The control of the correct crotch diameter in the middle between waistline and forkline by joining the inseams together. Edited by Schneiderfrei, 03 June 2015 - 09:09 AM. Many thanks once again for Peterle for his help with the more technical aspects and my unsmoothlich German translation. Excellent; many thanks to you both! Edited by dpcoffin, 03 June 2015 - 12:55 AM. Thank you. The translation of this "installment" is much more natural. Thanks a lot Schneiderfrei!! This is indeed a common fault, especially on today's young people who often have terrible posture. By looking at the actual profiles there are a number of things that are incorrect for the figure and posture of the wearer. For a pair of traditional men's trousers the legs are angled too far forward which produce the baggy behind. The extra room required for a pattern of this type is too low down, it should be at the centre height of the buttocks, not the bottom of the buttocks where the legs join. Something that follows from the way the pattern has been fitted to the wearer is the wearer would have to stand with his legs reasonably far apart to straighten out the inner leg wrinkling, the pattern draft should have the legs closer together to get rid of much of the excess fabric at the upper part of the inner leg. Some necking down at the top of the legs would help but usually a pair of baggy fit trousers of this traditional style can routinely be made with a V shaped upper leg join. For closer fitted trousers setting some thigh gap fixes at least some of the cross wrinkling under the buttocks but it should not be necessary for trousers of this type. Please, Hutch, bear with me, it is extremly difficult for me to understand what you explain. And I would like to understand it. Can you maybe add a little drawing ?? Drawing is a bit tacky as I don't have the same drawing tools on my Win7 64 box but it should make sense. Sorry if the terminology is unauthodox but I have an engineering brain. 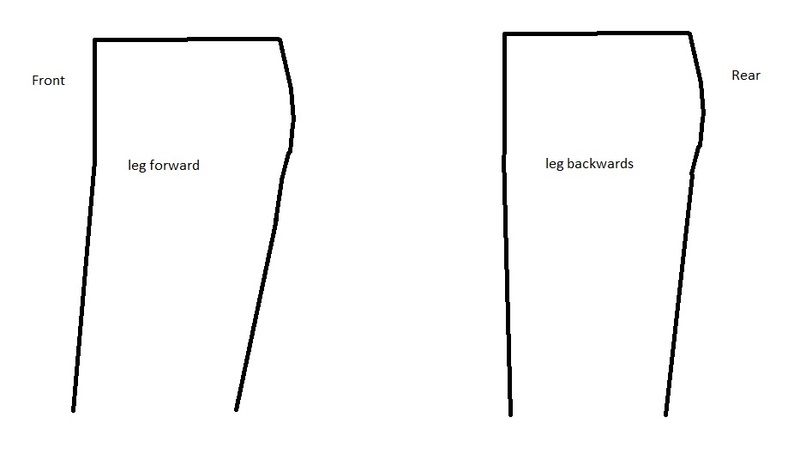 A figure and posture that is prone to be a bit stooped with a forward lean, the leg angle is adjusted forwards to match the natural posture of the person where if a person's posture and figure type is very straight up and down (me) you change the leg angle to closer to vertical. Getting this adjustment right removes much of the baggy behind that is shown in the original photos of this topic but you also have to be aware that that you can restrict movement if the back length is too short. There are a couple of ways to solve the restriction in movement, on a traditional shaped pair of trousers you must take up the extra movement at the point of the behind, not the bottom of the buttocks, literally the most protruding part so that there is extra fabric at the point of stretch. If it is sporting based, the mod I suggested in another topic helps in things like cycle shorts, climbing pants and skiwear but it is probably not necessary in a traditional pattern design men's trousers. Depending on the amount of movement which in turn depends on the figure of the wearer, adding a bit more material to the back of the leg from the bottom of the buttocks tapering down to the knee gives a longer stretch area which reduces the localised stretch at the bottom of the buttocks. Edited by hutch48, 04 June 2015 - 09:28 PM. Thank you, Hutch, very much! Now it is clear. It is not your terminology - there are holes in my english. (its position to the pelvis and the behind). If I have understood the the reference point from the behind the kneecap, the old book is describing the same characteristic that I have mentioned, The reference point from the rear kneecap to the buttock position is measuring from the back of the leg where I have referred to the hip joint to the knee joint to set the angle from the side view of the garment. Its simply using different reference points but it is the same adjustment.